German students and faculty attending the performance Beat the Devil! Faust, the Whole Story by storyteller and actor Glen Williamson in Santa Fe. to become perceptive readers, listeners, and viewers of German texts, films, and other media. The graduate curriculum in German Studies offers historical breadth as well as particular depth in areas that correspond to the research interests of our faculty. We offer courses focusing on the aesthetic, philosophical and literary landscape of the enlightenment, romanticism, and realism, as well as seminars that trace major theoretical and cultural trends of the 20th century up to the present. Core courses offered on a regular basis are centered on important writers, aesthetic concepts, and cultural currents from the 18th through the 21st centuries, including critical theory, film studies, and gender studies. Special-topics courses offered in recent years have focused on such diverse themes as terrorism, fairy tales, and memory culture in literature and critical thought. Graduate courses are taught either in German or in English. Graduate students in German Studies at UNM also receive thorough training in the teaching of German as a second language, including pedagogical theory and practical classroom experience. Students are encouraged to expand their academic expertise and gain linguistic proficiency by taking advantage of our academic exchange programs at partner universities in Bonn, Graz (Austria), Halle, Heidelberg, and Würzburg. 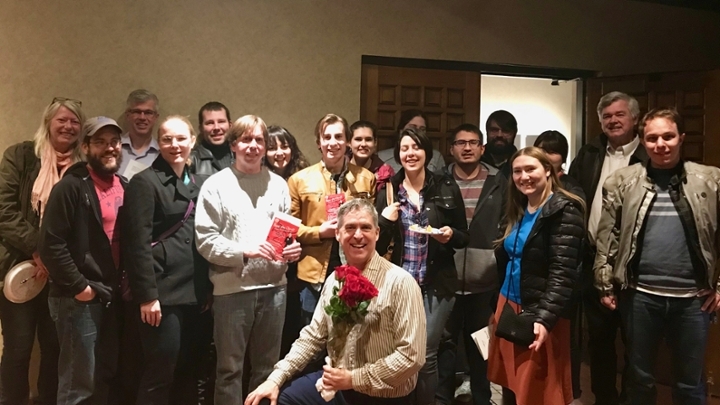 Our program also offers a wealth of extra-curricular activities, such as a weekly "Sprechtisch," poetry evenings, and film screenings, which provide additional opportunities to practice German and network with other interested students. In addition to our on-campus course offerings, every summer German students also have the unique opportunity of earning credit by enrolling for the German Summer School, an intensive 4 ½-week immersion program conducted in Taos Ski Valley, NM. The intensive nature of this program, including interaction with visiting scholars and teachers from across the U.S., Germany, Austria, and Switzerland, often enables students to advance an entire level in the course of one full session. Scholarships are available. For more information please see the weblink or contact German Summer School Office at 505-277-7367. Check out the University Catalog for German! All students enrolling in German 101, 102, 275, 201, 202 and 276 who have not already taken German courses at UNM are required to take an online placement test. Note: Your exam results must be turned in to your instructor during the first week of class. Students must see the German Summer School program coordinator in Ortega 229B (277-7367) M-F 8-12 & 1-5 or may email at ebologa@unm.edu to receive an anonymous log-in ID and password for the placement test. The student can use any computer that has headphones (or speakers, for your home computer) and QuickTime or Real Audio plug-ins. Click "Take a Placement Test". Log in with your anonymous log-in ID and password. Click the radio button next to "UNM German Test" and then click the button "Start test". Make sure you understand the user agreement, then click the button "I accept". Read the "instructions" page carefully, then begin the test. "Commit Answers/Finish Test" so your answers can be evaluated. Log back in to http://placement-test.mmlc.northwestern.edu/external/unm/ with your log-in ID and password. Click on the button "Placement Results". You will see the percentage you scored. Print out this page. Write your name in the top right-hand corner. During the first or second class meeting, provide the print-out to your instructor so he or she can see whether you are enrolled in the appropriate class level.